This isn't your average yob trying to be creative. No, this is the work of the well known vandal street artist, Banksy. 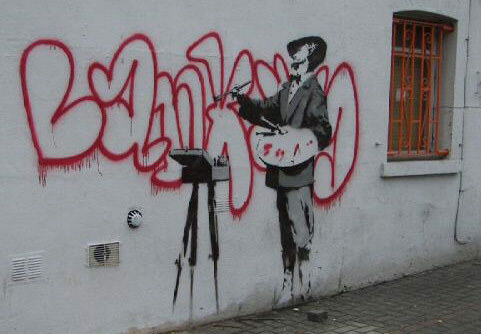 Banksy has built himself quite a reputation of being a creative street artist (and making a lot of money off it), and not just someone making his mark, and this is no exception. This post isn't about the ethics of whether this is vandalism or not, but about the sale of this piece. The owner of this chunk of wall in Portobello Road, London, has decided to sell it on eBay. Wall and all. At the moment, bids have exceeded £200k, and you still have to pay for the demolition/removal. Pretty impressive for a bit of spray paint and a stencil. If you like this, check out some of Banksy's other pieces.